This super yummy pasta salad is perfect to take along to a holiday pot luck or party. You will have everyone asking for the recipe, I promise! It's up to you if you share it or keep it to yourself! It is super easy to put together and the Chunks of moist rotisserie chicken, creamy dressing, and flavorful cranberries join up with the rest of the ingredients to make this a go to recipe year after year. I first came across this recipe in a cookbook from church, and am so ever glad I did! This would be a perfect use of leftover holiday turkey! So good, so light and refreshing! I made things easier by dicing up meat from the leftovers of a rotisserie chicken. The original recipe calls for 16 oz. of dried cranberries. I think that sounds like a lot, so I use only 1 (5 oz.) bag. I leave out the green onions, and although I loved the slivered almonds (and happen to have them on hand) I wonder how pecans, or even toffee coated pecans would taste. I think the pecan pieces would add another depth of color to the dish, so will try that next time. Festive Poppy Seed Pasta Salad. 8 oz. poppy seed dressing. Cook and drain pasta, rinse in cold water and let cool. 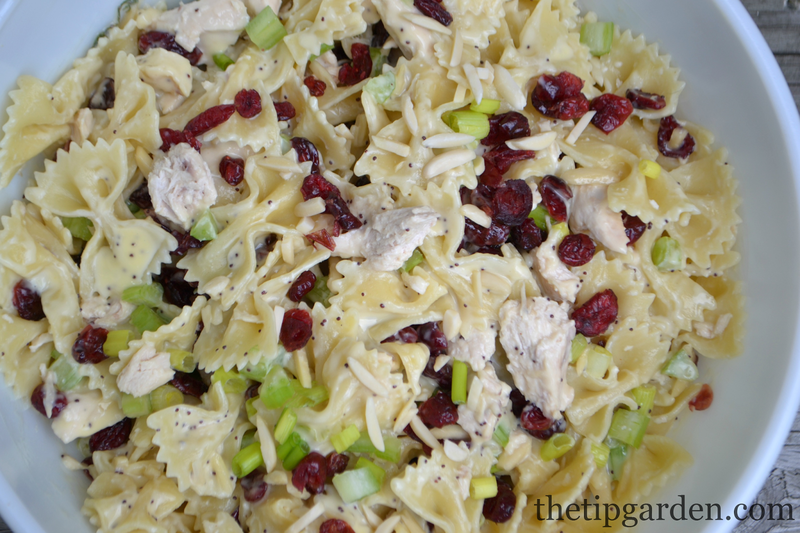 In mixing bowl mix together, pasta, chicken, cranberries, celery, green onions, and almonds. Stir in poppy seed dressing.